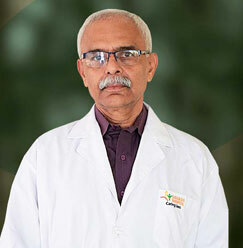 Dr. Vikram Singh Chauhan is titled and designated as Professor at Sharda Hospital. He has been working in the hospital since its inception. 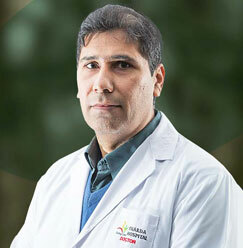 With over total experience of 15 years, Dr. Chauhan joined as Assistant Professor. 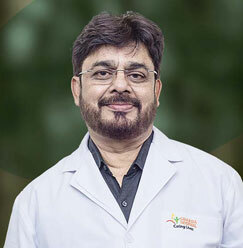 Subsequently, he was promoted to the post of Professor.Apart from being a member of various surgical societies, his clinical interest is in breast, parotid and thyroid surgeries. Dr. Chauhan has published research papers in all key surgical papers and has presented journals and attended various conferences all over the world. Acute osteomyelitis associated with Deep vein thrombosis in a patient of acute abdomen: A diagnostic dilemma. Journal of Clinical Orthopedics and trauma 3 (2012) 112-114. Xanthogranulomatous Cholecystitis: Challenges in Management & Feasibility of Laparoscopic Surgery. Int J Med Res Health Sci. 2013; 2(2):212-216. Comparison of efficacy and tolerance of short- duration open-ended ureteral catheter drainage and Tamsulosin administration to indwelling double J stents following ureteroscopy removal of stones. Hong Kong Med J.2015 Apr;21(2):124-30. Jejunal Diverticular Perforation: An atypical presentation of Acute Abdomen: A retrospective analysis. International Journal of Contemporary Surgery, Jan-June 2017, Vol.5, No.1. Can persistent post-operative antibiotic prophylaxis 45 following elective laparoscopic cholecystectomy be 6 completely done away with in the Indian setting? A prospective randomised study. Journal of Minimal Access Surgery 2017.